Admit it or not, every parent needs screen time to escape from their child. Or sometimes, they use it as a last resort to calm down their child's tantrums. My husband does that a lot. I tend to do that too when we are travelling or I really need to distract my child from something, may it be a violence while watching tv or for me to be able to give her medicine. 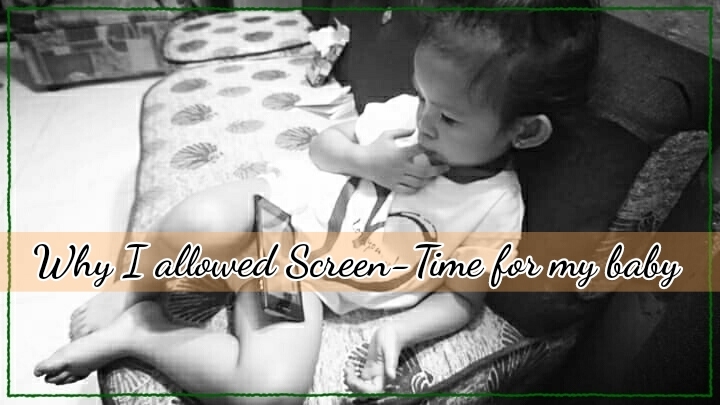 Don't judge, I'll tell you more valid reasons why I allow screen time for my baby. When she was still months old, I played nursery rhymes video on our television most of the time in a day even if it's annoying and even if I memorized all of the nursery rhymes included in the playlist. My baby likes it, more of I like it because I can do something else. And that's the reason why my baby doesn't learn how to walk and crawl at the early stages of her life. Blame it on me, I knew that already. But that's not exactly what I want to tell you. From this, I learned that everything should have limitations. Again, do not play it all day! Just set an hour or 30 minutes everyday for your child to wander, learn, explore or watch something. But if you do not want to, then sing for your child. Repetition should be consistent though. As she aged, we watch different kind of nursery rhymes, phonics lessons and subscribed to three youtube channels. Chu Chu TV - this is where she learned her ABC. Not that she is able to sing it out loud but she can also identify them one by one. She also learned the numbers through this. Busy Beavers - this is where she learned about colors and shapes. I played their videos every morning and she is eager to watch them and after a couple of weeks she was able to sing and dentify shapes and colors because of that. Now, she knows fruits and vegetables too. Wholeheartedly singing each of them when we are having our "momfiemoments" singing together before we sleep at night. Little Baby Bum - she enjoys nursery rhymes with this one. Her favorite? If you're happy and you know it, 5 Little Ducks and Wheels on the Bus. She learned new words too. But I still let her watch some phonics video, first words video that repeats every after word. Most of the time she wants to watch alone then a day or two she will mimic it with me, so that's my cue then I have to watch it with her so I can also understand what she is trying to say. It doesn't hurt to have some "screen-time" with your baby. Just supervise them, guide them and feed them with educational videos only. There are so many educational videos at youtube. Or if you are hesitant to leave them over youtube channel then download them and transfer at usb, plug on your tv and play it. That's one of my tactics too instead of letting her watch cartoon channels. Again, screen-time can be okay as long as you know your limits and goals on why you allow your child to have them.